1998 Trimbach Riesling Clos Ste. Hune - nice minerality here with flinty notes, along with some wite flowers. Kinda lean on the palate. There's ripeness but the finish is still acidic. With the salted cod and potatoes, the wine turned very metallic with salty minerals... which was not so pleasant. Then our bowls came - each with half a lobster - and the rich, thick soup was slowly ladled on top. The lobster was very, very good... and the bouillabaisse itself was as good as I've ever had it from David. Tonight the rouille seemed thicker than I remembered, and with a pretty strong kick from the pepper. I couldn't stop myself from lathering a second and a third slice of bread with it! ...then David once again came over and shaved enough white truffle on top so that we could no longer see anything else. Now EVERYONE was happy. 2004 Ponsot Morey Saint Denis Cuvée des Grives - nose was very open and lovely, with leather, bacon, farmy, and floral notes like violet. Also a little smoked meat later. A beautiful wine to drink now. David uses local farmed chicken, and it was delicious served with autumn vegetable casserole. Initially just wanted a little wing, but it was incredibly salty thanks to the crust... so I took a slice of the breast that turned out to be very tender. 2003 Kistler Pinot Noir Sonoma Coast - more alcoholic, sweeter both on the nose and the palate. Honestly a little disappointing tonight. Lomo de Rubia Galega - ah yes... so this is my 8th time having Rubia Galega since I was introduced to it earlier this year, and I still find it totally awesome. Most of the table hadn't had it before, and I once again introduced it as something along the lines of: "this may not be the best beef you've ever had, but you've probably never had something like it before". A 12-year old Galician ox, slaughtered after having lived a pretty long life, and dry aged for 120 days or more for that unique flavor and tenderness. Simply amazing. And the best taters and lettuce to go along with it! 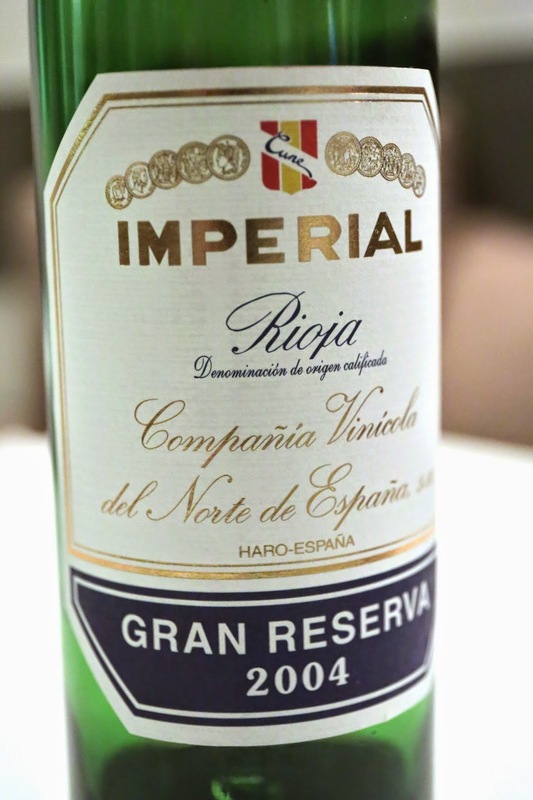 2004 CVNE Imperial Gran Reserva - decanted for more than an hour before serving. Minty nose, still a little closed, with some grilled meat. Still pretty big tannins here so it stood up to the beef, but at least there's some acidity here and went along with the sauce for the lettuce. I was dying. I'd been full since the risotto, and with every other bite I kept adjusting my pants under the table while secretly hoping that no one - especially the guest of honor - would notice. I had deliberately paused for a few minutes before taking my one slice of the beef, and now I was in pain. I told the staff sternly that we could take no cheese or dessert, but David insisted on sending up some fruit. The persimmon were incredibly sweet and crunchy, and each quarter seemed the size of a small fist. The atemoya was pretty ripe and sweet. A wonderful evening with delicious food and wine. Many thanks to our guest of honor for the treat.